Can Evesham turn base metal into gold with this wizard-looking 32-incher? Like alchemists of yore, we’re convinced that Evesham has employed wizards to create its none-more-affordable Alqemi range of LCD TVs: it has certainly succeeded in turning base materials into gold. But, although the 32SX represents ridiculously good value for money, there are inevitable compromises that are highlighted by some of the other players in this test. First impressions of this HD-ready 32in LCD TV are good, as corners don’t appear to have been cut in the styling. The 32SX looks more expensive than it is, resplendent in piano black and equipped with a desk stand – so much so, it could nestle in easily with recent offerings from LG or Hitachi. It’s disappointing to discover that, after a good start with some solid build quality, connections are just adequate. For starters, there’s only the one HDMI input – almost a hanging offence in this high-definition day and age. The rest of the connectivity roster is fairly standard: component video input, twin Scarts (both RGB-enabled), a PC connection (for using this TV as a monitor), and the familiar lesser connections. Weirdly, the power switch is on the back of the set. Thankfully, getting the 32SX up and running is a walk in the park. The first time that you power up this 32-incher, it asks you if you would like to autotune the digital channels: so, as long as you have an aerial hooked up, you can be happily watching Freeview (there’s a built-in digital tuner) ina matter of moments. The 32SX’s menus are easily understood – it’s just a shame that you have to do so using the terrible handset. The remote is a repeat offender: it’s the kind you see bundled with budget TVs. Spongey buttons? Tick. Difficult to navigate? Tick. An exercise in frustration? Tick. Thrown out of the window? Tick! Once you reconcile yourself to the veins in your temples throbbing every time you glance at the remote control, you can settle down to some decent pictures – so decent in fact, that this budget beauty is more than capable of giving some of the key players in this group test a run for their money. The aforementioned digital tuner ably demonstrates that the 32SX is capable of delivering good standard-definition pictures – still an important factor in selecting a TV. Colours are nice and bright without being gaudy, edges are sharply rendered, and noise is kept to the bare minimum. What’s more, the picture performance improves with high-definition sources, which is a little surprising for a budget offering. 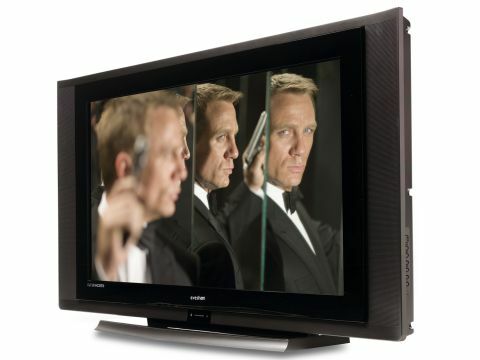 The 32SX is remarkably resilient with our test Blu-ray disc of the now classic Casino Royale. It copes admirably, by LCD’s standards, with the movie’s many nocturnal scenes, as images enjoy good black levels. Colours have more verve in high definition, the level of detail impresses, and images are sharper than we were expecting: all in all, a strong HD performance for the price. It’s a shame that the audio is something of a damp squib. The 32SX’s speakers are lacking in oomph, something that swiftly becomes apparent as they attempt to cope with a high octane soundtrack like Casino Royale. Virtual Dolby Surround is also largely ineffective. The Evesham 32SX does have its flaws, mainly with audio and ease of use. That said, it provides much better pictures than we were expecting for the lowly price tag, and for that we salute this plucky little TV.